On vacation 22 years ago, on her first trip to the West Coast, Cindy Shirley traveled from the Ohio Valley with her mom and dad to watch the H1 Unlimited hydroplane boat race on the famed Mission Bay, California. This weekend, she returns as the only women crew chief in the H1 Unlimited Hydroplane Racing Series, the fastest race boats in the world. Mission Bay is known to have one of the fastest 2-1/2 mile racecourses on the circuit. Shirley and her family love racing, especially powerboat racing, and would travel to many regional races on family vacations. In 1997, she returned to San Diego on East Vacation Isle pit row. Except this time she wasn’t just a fan, she was a member of the famed Miss Madison Racing team. At the time, she was one of only a couple women crew members on race boat teams. Wearing a DeWalt Tools crew uniform with wrenches and boat lines in her hands, she remembers vividly that first year in San Diego. “I got off the plane, looked at my mom, and proclaimed I was home,” Shirley said. Although Shirley never moved to San Diego, she enjoys returning each year to Bayfair. This year on her annual trip, she has a new role. 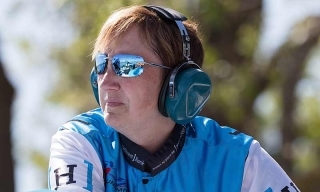 In a homecoming of sorts for Shirley, she returns to lead the eight-time national champion team as crew chief of the U-1 Miss HomeStreet hydroplane, one of the fastest in the world. She also returns as the first woman crew chief to have won a H1 Unlimited race in the sport’s 115-year history. “It’s scary, but exciting,” Shirley said with a laugh. Shirley was named crew chief of the Miss HomeStreet raceboat team in the off-season. Her appointment started a new chapter in the team’s storied history. She is the first female crew chief of a turbine hydroplane and the first full-time crew chief in the modern era. When Shirley first got involved with the Miss Madison Racing hydroplane team, she was just hoping she’d get a chance to wash the boat after races. Her career in racing started in the 1990s when she did administration work for the smaller automotive-powered hydroplane series. She started volunteering for the Miss Madison Racing team. Over the years, she has been in charge of driver-safety systems, general cockpit maintenance, and communicating with the team and drivers. Shirley has done a little of everything, from mixing glues to installing safety systems over her career in boat racing. But now, Shirley has the biggest job there is and has a chance to stamp her name on history in the process. “I don’t fit the traditional mold of being the wrench person or the tech person that knows all the specifics,” Shirley said. But she’s catching up on some of those specifics. “In the past couple of years Cindy has helped build a strong team that really values camaraderie,” driver Jimmy Shane said. He said Shirley is doing an outstanding job. Originally from Louisville, Shirley currently resides in Everett, Washington, where she is the director of the Office of Research at the University of Washington. Ever the competitor, Shirley said she is not satisfied with winning one race. She would like nothing more to become the first two-time winning crew chief or more. She would like nothing more for her team to win the last race of the season, September 14-16, 2018, on the super fast Mission Bay racecourse.